OHIO VALLEY — The winter season brings all kinds of weather in the Ohio Valley, but one is often regarded with a special anticipation for some and disdain for others. Snow, while visually appealing can create hazards when travelling, but many may not know how it is formed. Josh Fitzpatrick, a 2001 graduate of Gallia Academy High School and long time meteorologist, lends his knowledge about how the white precipitation occurs. He explained that the average annual snowfall for our area, including Meigs, Gallia, and Mason is about 20 inches. While recent years have been light on snowfall, he says the chances of significant snowfall this year is higher because of the cold air in the area. “It just needs to meet with moisture from the Gulf of Mexico. That’s how we got big snow storms in March 2015 and January 2016,” said Fitzpatrick. In order to predict the weather, Fitzpatrick and other meteorologists look at weather models and computer-generated forecasts to look ahead at the weather. When discussing predictions for snowfall, he explained that subtle changes in temperatures and wind in the atmosphere can make significant difference on how much snow can fall. “If I miss a rainfall forecast, not many will remember. But if a snowstorm isn’t forecasted accurately, folks will remember that for many years. Winter weather forecasts can make or break a meteorologists’ reputation,” stated Fitzpatrick. Fitzpatrick currently works in central Virginia at the NBC29 station as a meteorologist after working in the Huntington area for 10 years. 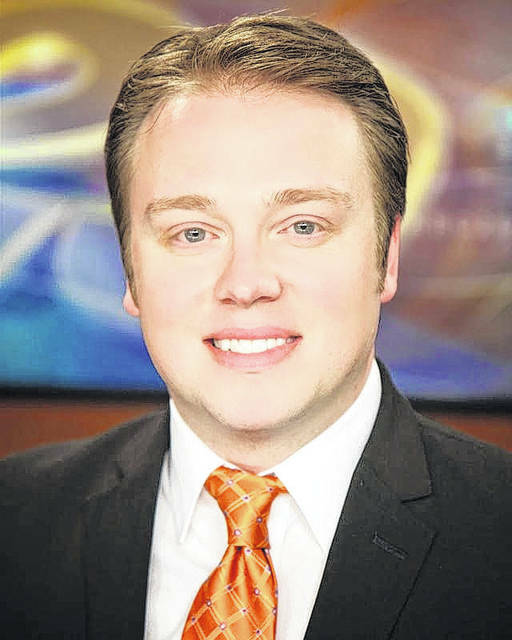 He graduated from GAHS in 2001 and earned a Bachelor’s of Science in Broadcast Meteorology at Mississippi State University.